Happy New Year my friends. I hope your new year has started off well (and continues to be wonderful). I'm stopping in quickly (as I'm in the midst of packing for our trip tomorrow) to share a couple of exciting news bits. First exciting new bit is that my newest project 'Floral POP!' is on the January 2018 cover of Homespun Magazine. Yay!! This issue it out today and I cannot wait to get my hands on a copy the magazine. This newest issue of Homespun also includes the sneaky peeks of the 2018 BOM, which I hear, is created with gorgeous Tilda fabrics. Okay, are you ready for my second bit of exciting news? Not only is my work published in a magazine, but I'm also in the Quilters Companion 2018 Diary! Double Yay! See the table runner which this diary sits upon? Come back in a couple of weeks for my TROM post. I was so surprised when I received a copy of the new QC diary in the mail. We'd stopped into the post office on our way to do a quick grocery shop and I couldn't wait to get home to open my parcel. 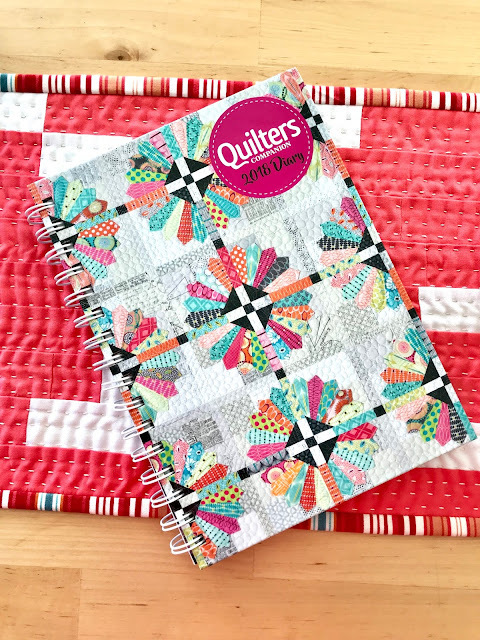 Without reading the attached letter, I quickly started to flick through the pages of this beautiful diary when lo and behold, there was a picture of my Tesela quilt in the first week of June. Squeals of excitement from me and my little lady as we traipsed behind the boys at the grocery store. I was excited to see the quilt and Amelia was excited because she's the one who named the quilt 'Tesela'. She's forgotten this, but she told me that she loved that name so much that she wanted to call her daughter 'Tesela'. I think she's changed her mind since this quilt was made though. I'm going to go and finish packing suitcases now. We head out on our family holiday tomorrow and I need to make sure that everyone has packed enough clothes (and underwear) for the next two weeks.